My mom cooked for our family of six every night, kept track of my three brothers and me, and did all the housework. This was before feminism came to our Los Angeles suburb, so my mom just did her job and tried to get us to help when she could. But sometimes we didn’t do our part (and who could blame us–we were 6, 8, 10, and 12 at the time of this memorable meal). My mom would yell and we might or might not be more helpful next time. Eventually she came up with a better strategy. Chuck: “OK, coming,” as he adds another Lego structure to a massive Lego housing development. Mom: “I need you to set the table. Dad will be home soon.” Chuck: “Ok, coming,” as he frames another Lego house. My dad came home and my mom called us to dinner. We all rushed to the table and sat down. Then we noticed. There were no plates or forks or knives or napkins. Clumps of salad covered in ranch dressing were served up for each of us, right on the table. All eyes turned to my mom in puzzlement. She shrugged and said, “Who wants mashed potatoes? Pot roast?” And then she spooned a glop of mashed potatoes in front of each of us. We were wide-eyed. Then she shoveled a chunk of pot roast to each of our places, spooning gravy over each serving. The gravy ran all over the table and dripped onto the floor. My mom cracked a hint of a smile. My dad started laughing. Then we all started laughing. We couldn’t stop. Soon we were laughing so much our stomachs hurt and tears dripped down our faces. It was clear that no one would get forks or knives. My mom took the lead, picking up strings of pot roast with her hands and putting them in her mouth, and we followed suit, with gravy dripping down our arms and all over our shirts. Eating the mashed potatoes took some creativity, with some of us using cupped fingers to scoop them into our mouths and my brothers bending over to eat mouthfuls directly off the table. Salad was best eaten one leaf at a time. Our faces were plastered with gravy and mashed potato. We couldn’t stop talking about our funny dinner. We liked not having to cut our meat or do manners. We were stunned at my mom’s bold move, and this made her cooler than the other moms, who wouldn’t do something messy like this. For weeks afterward, one of us asked my mom if we could have dinner right on the table again. We never did (or at least not yet), but Chuck never skipped out on setting the table again. Looking back, this dinner was just one of many of my mom’s independent and creative acts that probably kept her sanity. Later bolder ones included becoming a belly dancer and refashioning rooms in our house to look like a sheik’s palace, and her decision more than a decade ago to follow a strict vegan diet. She motivated my dad to join her, which resulted in their founding a highly successful vegetarian Web site and publishing vegan cookbooks. 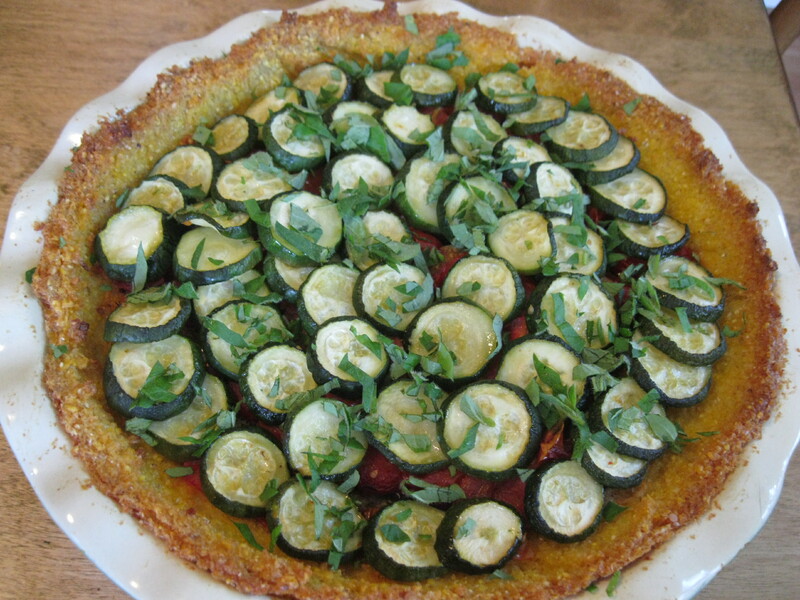 This polenta and roasted vegetable pie is what I would serve for mother’s day lunch, if my mom lived close enough to come over for lunch. Mom, thanks for being you. I love you. Prepare the vegetables: Heat the oven to 375 degrees. Thinly slice the eggplant into ¼-inch thick rounds. Brush a baking sheet with 1 tsp olive oil, put the eggplant slices on the pan, brush them with the oil remaining on the brush, and sprinkle them with salt and pepper. Slice the tomatoes in half, put them on a rimmed baking sheet, toss them with 2 tsp olive oil and half of the minced garlic and salt and pepper. Put both pans into the oven. After 7 minutes, remove the tomatoes from the oven. Turn the eggplant slices over and bake for 5-7 minutes or until lightly browned. Keep the oven warm to finish baking the pie. Make the crust: Brush a 10-inch pie pan lightly with oil and set it aside. In a small bowl, add the cornmeal, 1 tsp of salt, and 1 ½ cups of cold water. In a medium sauce pan, bring 2 cups of water to a boil. Slowly stir in the cornmeal mixture, using a whisk. Turn heat to medium low, and stir mixture until it gets too thick to continue stirring, about 5-8 minutes. Spoon the mixture into the prepared pie pan, using a spatula to bring the polenta up the sides of the pan and even out the polenta. Set aside. Make the bean mixture and prep the zucchini: In a small sauté pan, heat 1 TBS olive oil over medium heat. Add the remaining garlic, cook for 1 minute, add rosemary, beans, and ½ tsp salt and sauté, stirring occasionally, for 10 minutes. Remove from the heat and put in a food processor. Add 2 TBS water and 2 tsp olive oil and process until smooth, adding more water or oil if needed. Taste and adjust salt or pepper if needed. Slice the zucchini into 1/4-inch thick coins and set them aside. Assemble the pie: Spoon the bean mixture into the crust, using a spatula to spread it evenly. Next, place the eggplant slices, overlapping them so there are multiple layers. Add the tomatoes in an even layer. Starting from the outer edge, place the zucchini slices, overlapping them tightly because they will shrink when they are baked. Top the pie with 1 TBS olive oil and a sprinkle of salt. Cover with foil and bake for 30 minutes. Remove the foil and bake for another 15-20 minutes or until the zucchini is cooked and lightly browned. Garnish with fresh herbs and serve with a green salad. The pie can be assembled in advance, brought to room temperature, and baked before serving. 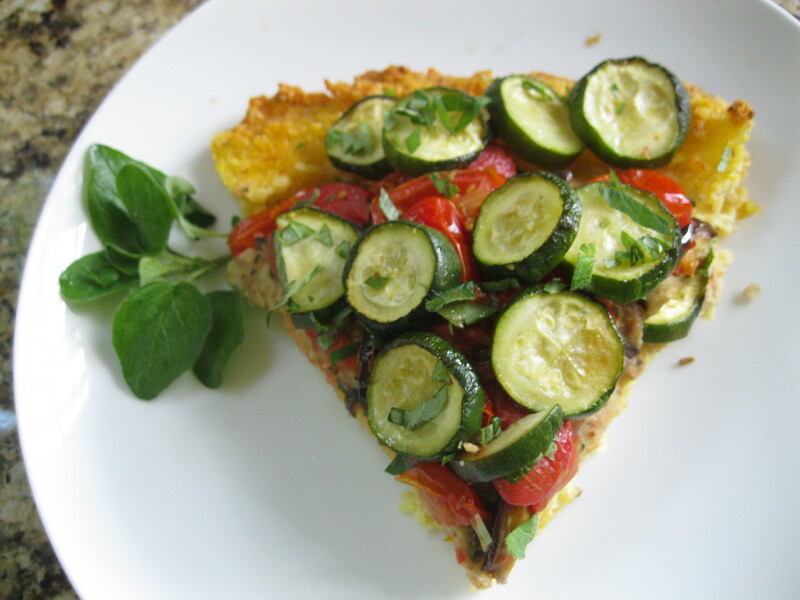 This entry was posted in Beans and legumes, Comfort food, Healthy, summer food, vegan, vegetables, vegetarian by Amy. Bookmark the permalink. Your mom sounds wonderful. What a great story. By the way, the sweet potato chili came out great. It freezes well, too.